In far better weather than the first 2018 friendly fixture, this week we were greeted by warm sunshine and light winds. Back in the home grounds of Harrowden Hall, the golf course was also in better condition than we had played on during the previous match. Thanks, as always, go to everyone at Wellingborough Golf Club for their hospitality and for making the course available to us. The Warwickshire management commented after the matches, what a pleasure it was to visit. So to the matches themselves, the Northamptonshire team was made up of young experience and genuine youth. Joe Quinn making his Men’s debut at the age of 15 – Joe has been and will continue to be a vital part of the County Junior team, but after some fantastic recent form, was rewarded with his first senior call up. Also back into the fold was Jamie Powell, returning from the Professional ranks, Jamie has recently got back his amateur status and is another welcome addition to the County squads. Added to these two was home member Tiger Adams, Jordan Darnell, fresh from his debut success at Luton, then the more experienced County players, Callum and Michael Farr, Mikey Chambers, Tom Burgh, Charlie Salter and Liam McNeela. Warwickshire travelled to Wellingborough with a very experienced and strong team – having recently returned back from a week long training camp in Spain and having beaten Leicestershire in their previous friendly fixture. The foursomes matches saw Mikey and Callum lead off, followed by pairings of Jordan/Liam, Jamie/Michael, Joe/Charlie and Tiger/Tom. The Warwickshire pairings got off to very good starts and through 6 holes all matches were in their favour by one or two holes. But the Northants pairing slowly started to make some inroads as our familiarity with the course came to our aid. In all but one of the 5 matches, our pairs got back in front. With Callum and Mikey in control throughout the back 9, despite having to play the last with a one up advantage, they would make a birdie to half the hole and put the first point on the board. By this time, Jordan and Liam had succumbed to a 4&3 defeat, the pair not gelling as well as they had done two weeks earlier and against an experienced pair. At this level, one or two mistakes are highlighted and difficult to get back these holes in the foursomes format. Jordan in only his second outing has impressed us all and Liam has proved his tenacity on enough occasions over the past 12 months to know he is still a strong team player. The remaining 3 matches would all reach at least the 17th. Jamie and Michael again took control of their match around the turn and would hold on to this advantage stepping onto the 17th tee 2up. A secure par on the long 17th would lead to handshakes on the green and a 3&1 victory. Welcome back to County golf Jamie! The story of the morning was in match 4 where Charlie, playing the experienced partner role for the first time in the Men’s team, alongside Joe Quinn. Slumped shoulders walking down the 10th fairway was not a good sign…at this point the pair were 3 down. Comments along the lines of ‘can’t get anything going’, can’t get the ball in the hole’ were swiftly followed by Charlie’s prediction that they would deliver the point…the Captain decided to leave them to their game. When they were next in view, playing 15, Charlie would hole a long bride putt and walked to the next tee, proclaiming their lead to be 2up!! A fantastic turnaround. Following a long and straight tee shot from Charlie on 17, Joe followed this with an iron shot that can only be described as pure!! Playing into the wind, Joe’s 6 iron from over 170 yards fell just 5 feet short of the flag, dead online…the fist pumps and high fives that followed were a pleasure to witness! Charlie knocked in the putt to seal an awesome victory to the two young lads and Joe’s first point on debut. In the final match, Tom and Tiger would also pull their match back around the turn and would continue to swing one way then the other – with some soaring drives from Tiger and Tom’s solid iron play, the two would give themselves a good number of opportunities – but the putts wouldn’t quite fall. So the match reached the 18th at all square. Following the tee shots both pairs had wedges remaining into the treacherous 18th green. Tom’s wedge looked to be well judged, leaving an uphill putt. The Warwickshire player knocked his shot into about 4 feet, but crucially above the hole..leaving a tricky, breaking putt. Tiger’s putt, which was further away than first thought, looked to be online, but finished just short. The Warwickshire player calmly holed their putt, which led to two disappointed Northants players. But we took an overall lead of 3-2 into the afternoon singles. Which represented a very good turnaround from the early phases of the match. So to the singles and as always, with 10 players the matches soon got strung out and it seemed more difficult than normal to know where to be at what time. Indeed by the time the first match finished on the 17th green, with Callum shaking hands on another solid victory – Charlie playing at the back of the field hadn’t quite made it through the turn. Mikey and Michael at 2 and 3 each turned in differing performances, both equally impressive in their own way. Michael was in control of his match from the start – he is currently in fine form, impressive ball striking and assured touches on and around the greens. Whereas Mikey was struggling a little with his swing and eventually on the surfaces too. To his credit Mikey’s attitude and desire shone through and he battled his way to a half point. At the point of Mikey’s match finishing, Northants had won 5.5 points from 7 games – with a total of 8 required to win the match overall. However, the middle order of Warwickshire produced some stellar golf, mixed in with Northamptonshire errors and provided a fight back that we expected. At one point matches 4,5 and 6 (Liam, Jamie and Joe) were 4, 6 and 5 down respectively through 11 holes!! Jamie, in match 5, could not produce his best and would soon shake hands on a 7&6 defeat (welcome back to County golf Jamie! ), but both Liam and Jo would produce efforts from deep within – Joe (at 15 years old remember), stemmed the tide against him and eventually shook hands on 15. Despite this defeat, as he had done all day, Joe wore a beaming smile and said he had really enjoyed hi day, learned a lot and would become a better golfer. Joe really impressed us all (opponents as well) with his attitude. Liam again proved his mettle and after some stern advice on the 12th tee, managed to sneak 3 of the 4 hole deficit back to take the match to the 18th tee. He certainly managed to pile some pressure on his opponent and his match would eventually come down to a birdie putt finishing fractionally short. A disappointing end, but an impressive comeback. In matches 7 and 8 both Tiger and Jordan would start slowly and continually be fighting to gain holes back, then lose another. Being a home member should be an advantage, but Tiger’s long game would not be upto the same standards of the morning, one of his comments ‘I’ve seen some places today I’ve never seen’!! Again to his credit, to stay in the match as long as he did spoke a lot about his character – Tiger would shake hands on the 16th green. The same green where Jordan’s match ended, with the result the same 3&2 defeat. Jordan’s introduction to County golf has been swift and I suspect he will have learned more about himself and his game from this defeat than he will have done from his two victories two weeks earlier. On the evidence of today, it was just the putter that let him down – his long game looked really solid and another loss to a very experienced County golfer. Tom Burgh at 9 and Charlie Salter at 10 would be left trying to get a result for Northamptonshire – following a run of 5 consecutive singles defeats in the afternoon. Good news came through that Tom, who had been in control of his match most of the afternoon, had won 3&2. Tom’s decision to relinquish the captaincy of the County 2nd team looks to have been a good one, his game looks solid and short game sharp. This left Northamptonshire’s very own ‘Ian Poulter’ – the self-declared Postman following his morning prediction…the afternoon was very similar for Charlie, down early left him having to fight back – one of the best shots hit all day came of the 9th in the afternoon, with Charlie firing a sublime iron shot from the new fairway bunker to within 7 feet – 2 holes later he would be playing from a long way left on the par 3 and would eventually lose this hole to be 2 down again. From there on, Charlie gained the two holes back to be all square on the 17th tee, both players would eventually hole testing par putts from around 6 feet to take their match and the overall match to the last hole of the day. A win for Charlie would see a 7.5 points each draw, anything else would result in a Warwickshire win. Unfortunately, Charlie would hit one of the poorest shots of the day from the tee and find that water on the left – though it was in a position to take his penalty drop, leaving a view of the green – his third shot finished just outside the approach shot of his opponent and a testing 30 foot putt along the crest of the big tier and then down the slope – Charlie measured this almost perfectly and a guaranteed bogey – his opponent on a similar line would knock his putt 3 feet past, but hole the return for personal and team glory – congratulations to a very strong and experienced Warwickshire. Well led by Captain Stuart. As for Northamptonshire, a few players have gathered some important experience and others have shown they are truly 1st team golfers now – results and wins in friendlies are not the be all for selection throughout the season, but we have seen a lot of evidence, with such a young side, that the future of Northamptonshire golf is in very good hands. 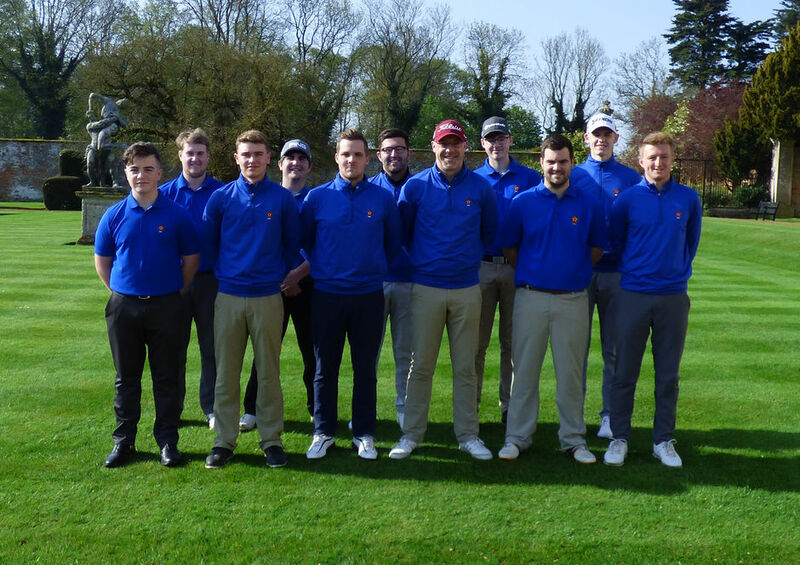 The league season begins with a home fixture (Wellingborough) for the first team and away for the 2nd’s at Cosby Golf Club, against last year’s champions, Leicestershire on May 13th – so the respective Captains have some very difficult choices to make. This fixture is closely followed by the annual pilgrimage to Skegness for the Eastern Counties Foursomes on May 19th and 20th.